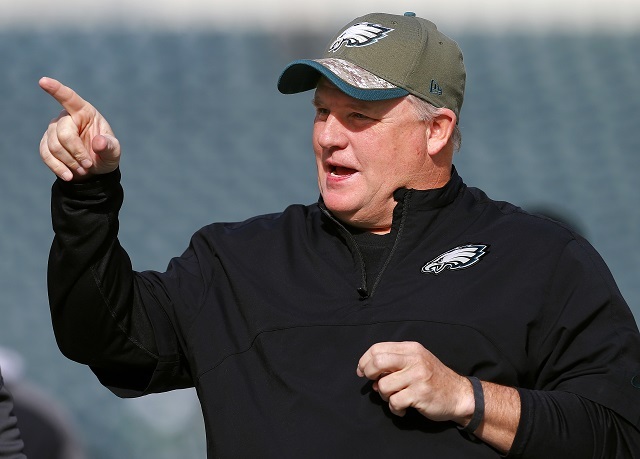 There is not a more enigmatic coach in the National Football League than the Philadelphia Eagles’ Chip Kelly. Just when you thought you had him figured out, he does something else to remind you that he moves to the beat of his own drum. It’s a bit of a cliche, but all you can really say about the former Oregon head coach is that you don’t know anything at all. We have a feeling he likes it that way. Entering his third season with the Birds, Kelly has more power than ever before. In an offseason that saw him wrestle away personnel control from former general manager Howie Roseman, Kelly spent most of his spare time reconstructing this Philadelphia team in his image. This organization has cut ties with the majority of the players from the old guard, added new faces at some key positions, and is prepared to build off of two consecutive 10-6 seasons. But even with all the changes that this new czar has implemented, one important question still remains: Who will be the Eagles quarterback? With the job effectively coming down to the newly-acquired Sam Bradford and the returning former-backup Mark Sanchez, everyone around the City of Brotherly Love seems to have an opinion on the matter. We have no issues when players are pinned against each other and forced to compete for the starting job. It removes the sense of entitlement from the equation, and forces the athletes to step up their game. However despite what Kelly says with regard to the quarterback position, we happen to feel that there should be no quarterback controversy whatsoever. Unless he proves himself to be physically unable to perform, this ship will be steered by Sam Bradford. No doubt about it. This isn’t to say we have anything against the gunslinger formerly known as “The Sanchize.” In fact, when the Eagles opted to bring him in to backup Nick Foles last season, we thought it was quality decision. For all his ups and downs with the New York Jets, Sanchez still led the team to two straight AFC Championship games. 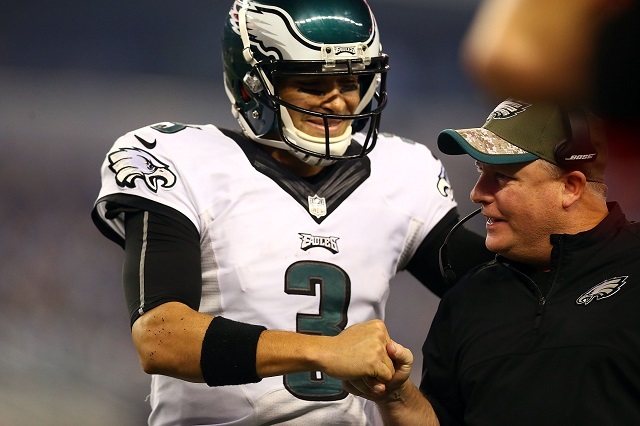 And in 2014, when he was forced to come in and replace an injured Foles, Sanchez showed that he was more than capable of running Kelly’s offense. He played nine games — starting in eight and going 4-4 — had the highest completion percentage of his career (64.1%), and posted a career-best 88.4 quarterback rating. What’s more important, he regained the confidence he’d lost toward the end of his days under Rex Ryan. That swagger has carried over into this summer’s organized team activities (OTAs) and the brief three-day minicamp. “He’s so much more comfortable in terms of what we’re doing,” Kelly said of Sanchez this year compared to last year. “A year ago at this point he was coming off (a shoulder) injury, had missed a year, he’s just at a different comfort level. He’s just sharper. This doesn’t surprise us one bit. Sanchez is another year removed from his shoulder surgery. He’s stronger, quicker, and more prepared. The terminology of this offense is more engrained in his mind and he doesn’t have to think as much. And we know he wants to be the starter — so he’ll put himself in the best position to make that happen. However, the problem for Sanchez is simple — and this is the God’s honest truth — he doesn’t have the same upside as Bradford. There is a good chance we’ve already seen Sanchez’s ceiling. And that’s why the former St. Louis Ram is one who should be under center come the regular season. Bradford is still in the process of rehabbing the left ACL he tore for the second time in as many years. So while he’s participated in 7-on-7 drills this offseason, he has yet to take a snap when the Eagles go into their 11-on-11 situations, the 27-year-old hasn’t been involved. Under these particular circumstances, the team has 12.9 million reasons not to rush him back before he’s ready. Still, Kelly feels the former No. 1 overall pick should be ready for 11-on-11’s come training camp. Or as he put it, according to phillyvoice.com: “God, we hope so.” Bradford feels the same exact way as his coach. If Bradford’s rehab continues to go well, and he’s a full-go come August 2, there’s no reason to think he won’t running the show. Bradford has the stronger arm, the quicker release, the general accuracy, and the potential to really make this offense fly. Forget everything that happened to him in St. Louis — that organization did nothing to protect him. In Philadelphia, Bradford has a better offensive line, the most weapons of his career, and a coach who knows how to tailor the offense to his strengths. Like we said, we’re all about open competitions. But when it comes to the quarterback position — barring any catastrophic setbacks — there should be no need for controversy. Bradford’s the guy. Deep down, we have to believe that Chip knows it as well; even if he’d never admit it to anyone else.